Hands of chef, napoleon cake. Dessert preparation top view. Pastry chef making napoleon cake. Biscuits and custard. Garnished napoleon cake. Hands of chef, dessert. Napoleon cake close up. Garnished pastry dessert. Chef making napoleon cake. Biscuits, custard and crumbs. 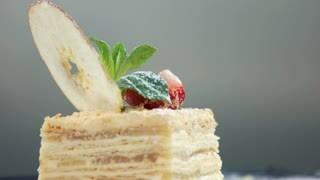 Chef garnishing napoleon cake. Dried apple, mint and strawberry. Process of making napoleon cake. 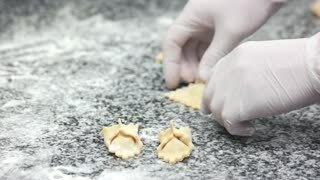 Chef hands putting custard on baked pastry. Cook at work. 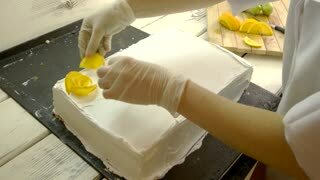 Female baker hands decorating cake. Big white cake and pastry chef. Cooking delicious dessert at restaurant bakery. Womans hand glazing dough products with yolk. 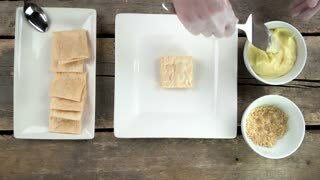 Pastry chef brushing raw dough with brush in yolk. Preparation before baking.